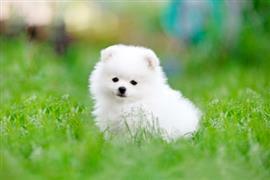 There are plenty of popular options to choose from when naming a dog with a white coat. Some owners borrow ideas from people with the surname White. Betty, Vanna, Barry, and Jack are all pretty common. Others might choose words that are bound to the color by meaning. Blanco (Spanish), Gwynn (Cornish), and Shiro (Japanese) are typical ideas that fall into this context. Probably the most widely used names are those taken from things that bear a similar hue. Among the top selected are Snow, Cloud, and Cotton. Additional options come from the color’s association with innocence and perfection in Western culture. Due to this symbolism, dogs with a white coat actually earn first impression bonus points. Ideas derived from the positive correlation include Purity, Virtue, and Hope. Some of our pages will contain a subcategory. A subcategory is a slightly more specific grouping than the main topic of the page. For a subcategory, we will include a separated table of names and corresponding descriptions. An example of a subcategory of Red Dog Names would be 'Dog Names Inspired by Red Wines'. If you have any subcategory ideas for the White Dog Names page, we would love to hear them. Use the form below to submit your ideas.